What is Max, TV Star? Max, the co-star of PetMeds.com commercials, comes to life as a real toy with as much personality off screen as he has on screen. Max is one of two 1-800-PetMeds mascots (see our Molly catnip toy for cats). Your dog will have tons of fun with Max's soft texture and two squeakers. Invite him to play with your dog today. All dogs will instinctively love to chew on their new toy. Do not permit your dog to continue playing with a toy that is broken or damaged. Please discard when worn. 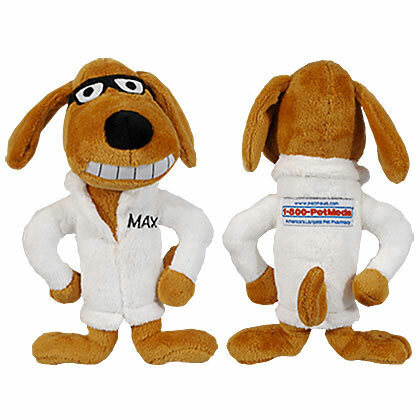 The Max Dog Toy is the perfect gift for your favorite four legged friend. Your dog will be thrilled when it discovers the two hidden squeakers! Polyester Fibers, Plastic Squeaker (Two inside toy).